Wilmington is Delaware's Largest City with 14 buildings that surpass 200 ft (61 m) and 2 that surpass 300 ft (91 m). Since its completion in 2007, the River Tower at Christina Landing is the tallest building in Wilmington. Rodney Square in downtown Wilmington, with the Dupont Building (right) shown with the Citizens Bank Center (middle) and the Delaware Trust Building (left). 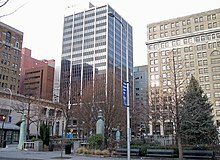 If built, 1001-1011 Jefferson Street would become the tallest building in Wilmington, Delaware, rising 510 feet (155 meters) [35 floors] and surpassing the River Tower at Christina Landing. 3 I.M. Pei Building 282 feet (86 m) 23 1971 Office 3rd tallest building in Wilmington; Contains most international companies in Wilmington. 4 Brandywine Building 260 feet (79 m) 20 1970 Office 4th tallest building in Wilmington; Part of DuPont's Headquarters until 2000. 6 Park Plaza Condominiums 250 feet (76 m) 18 1965 Residential 6th tallest building in Wilmington; 2nd tallest residential building in Wilmington. 7 PNC Bank Building 246 feet (75 m) 18 1987 Office 7th tallest building in Wilmington; Mostly occupied by PNC Bank. 8 The Residences at Christina Landing 241 feet (73 m) 22 2005 Residential 8th tallest building in Wilmington; 2nd tallest building in the Christina Landing complex. 9 Gateway Plaza 237 feet (72 m) 15 2006 Office 9th tallest building in Wilmington; WSFS Bank's Headquarters! 10 300 Delaware Avenue 230 feet (70 m) 17 1970 Office 10th tallest building in Wilmington; Mostly owned by TD Bank. 11 One Christina Centre 229 feet (70 m) 18 1988 Office 11th tallest building in Wilmington; Tallest Building in Chase's complex in Wilmington. 12 Three Christina Centre 226 feet (69 m) 14 1988 Office 12th tallest building in Wilmington; Second Tallest Building in Chase's complex in Wilmington. 13 Wilmington Trust Center 223 feet (68 m) 15 1985 Office 13th tallest building in Wilmington; Wilmington Trust's Headquarters. 14 Sheraton Suites Hotel 205 feet (62 m) 16 - Hotel 14th tallest building in Wilmington; tallest hotel in Wilmington. 15 Bank of Delaware Building 191 feet (58 m) 16 - Office 15th tallest building in Wilmington; Located next to Citizens Bank Center. 16 The Park View 190 feet (58 m) 15 - Residential 16th tallest building in Wilmington; Tallest building in North Wilmington. 17 Nemours Building 162 feet (49 m) 16 1936 Office 17th tallest building in Wilmington; Owned by a spin off of DuPont. 18 Delaware Trust Building 160 feet (49 m) 15 1927 Mixed Use 18th tallest building in Wilmington; This building features offices, condos, and retail. 19 DuPont Building 156 feet (48 m) 14 1908 Office 19th tallest building in Wilmington; Owned by DuPont,one of the biggest companies in Delaware. 20 Community Services Building 150 feet (46 m) 13 - Mixed Use 20th tallest building in Wilmington; The Wilmington Visitor Center is located inside of this building. DuPont Building 156 feet (48 m) 14 Mixed-use 1908-1936 This building is owned by one of the biggest companies in Delaware. 1 Hercules Building 602 feet (183 m) 42 Mixed Use Cancelled - If this building was built, it would've become the tallest building between Philly and Charlotte. Replaced by Hercules Plaza. 4 Colonial Tower 328 feet (100 m) 25 Mixed Used Proposed 2018-2020 This building will feature retail stores, offices, and condos. 5 2 Christina Center 290 feet (88 m) 23 (Estimated) Office Proposed 2018 If built, this will become the 3rd tallest building in Wilmington. It might be rescaled taller. 6 The Residents at Midtown Park 100 feet (30 m) 8 Residential Under Construction 2018 These apartments/condos will feature 2, 5 story buildings and 1, 8 story building. 7 Residents Inn Mariott 88 feet (27 m) 7 Hotel Under Construction 2017 This hotel will replace the old 1300 North Market Street Building. 1 Hercules Tower (Wilmington) 287 feet (87 m) 22 Mixed-use 2003 Demolished due to an arson in 1997.